February 27, 28, 29 – March 1 & 2, 1968. 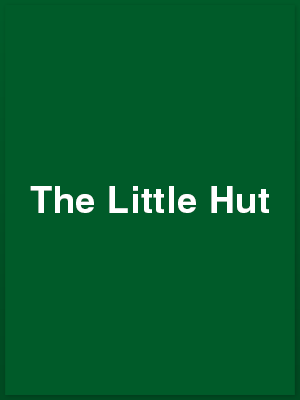 NLR wrote: “The Little Hut – Kitchen Sink, Avant-Garde, Psychodellic [sic]? – none of these things, but a Gay French Romp, and though excellently translated into English by Nancy Mitford, remaining stubbornly French. A very fine example of Good Theatre [I should add, I think] depending equally upon every facet of production, cast, set, props and slick dialogue, giving the back room boys and girls importance equal to those in the front room. It is laughter all the way in The Little Hut, by Andre Roussin, at the Barn Theatre, Southwick, this week, thanks to the Wick Theatre Company. This is indeed a ‘gay French romp’, as producer Nikki Le Roy describes it, as those attending the fourth performance tonight [Friday] and the final show tomorrow will find for themselves. Opportunities are ripe, like the vegetation, on the lush desert island on which shipwrecked couple Susan and Philip and ‘odd man out’ Henry find themselves cast. Henry, it transpires, has been Susan’s lover for years, and it is only a matter of time before the old liaison is renewed, but on a strictly week-on, week-off basis. Susan manages to get the best of both worlds in a remarkably amicable arrangement, though not without its fiery moments. Jack Bingham and Barrie Bowen, as Philip and Henry, exploit the humour of their rôles to the full. The delectable bone shared by the ‘dogs is portrayed by newcomer Susan Welton, who acts with charm and ability, and on first showing appears to be a real acquisition for the company. Jim Bebbington is highly amusing as the Indian stranger prince on the island, and Raymond Hopper appears as the Monkey. There is an excellent and realistic setting, designed by Barrie Bowen, and others assisting backstage are Terry Mase, Frank Hurrell, Morfydd Bowen, Frances Thorne, Bess Blagden and Margaret Perrett. In the words of producer Nikki Le Roy The Little Hut by Andre Roussin, currently presented at the Barn Theatre, Southwick, by the Wick Theatre Company is ‘naughty – well very naughty – but nice’. It is a gay, happy and inconsequential a piece of frivolous light comedy as one can find. It is a very difficult play for everybody calling a it does for a desert island setting, a wide range of specialised ‘properties’, some difficult sound effects, and action which must be sustained, in the main, by three characters. The Wick Theatre Company production scores heavily on all counts. The three survivors on the desert island are Henry, played by Barrie Bowen, Susan, played by Susan Welton, and Philip, played by Jack Bingham. The casting is excellent, the production adroit. I was especially enchanted by Susan Welton. She has a slight touch of the Joan Greenwoods which admirably suits the part of Susan in the quite peculiar circumstances in which she finds herself. Her husband Philip, a philosophical type, is just right for Jack Bingham and their friend Harvey, somewhat spoiled and tending to be querulous is equally well suited to Barrie Bowen who was responsible for the design of the excellent setting. Jim Bebbington both looks and acts well as the Stranger and Raymond Hopper appears briefly [and athletically] as a Monkey. It is all enormous fun. Slight carping criticism: it is a pity that the worn-out clothes had so obviously been ‘worn out’ with scissors.